Anything you can do, nature can do better. Chemical delivery systems, self-healing cells, non-stick surfaces — nature perfected those long ago. Now, researchers at Harvard have hacked nature’s blueprints to create a new technology that could have broad-reaching impact on drug delivery systems and self-healing and anti-fouling materials. The secret is secretion. Living tissues rely on their ability to package, transport and secrete liquid, where and when it’s needed. Nature’s secretion system is responsive, self-regulatory, and intrinsically linked with its surroundings but synthetic systems haven’t been able to replicate that complexity until now. The new system, described in a paper published today in the journal Nature Materials, was developed in the lab of Joanna Aizenberg, the Amy Smith Berylson Professor of Materials Science at the Harvard John A. Paulson School of Engineering and Applied Science (SEAS). Aizenberg is also Professor in the Department of Chemistry and Chemical Biology, co-director of the Kavli Institute for Bionano Science and Technology, and a core faculty member at Harvard’s Wyss Institute for Biologically Inspired Engineering, leading the Adaptive Materials Technologies platform there. 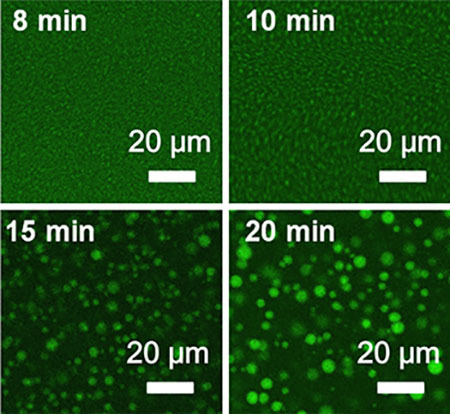 The new system, self-assembled through phase separation, consists of liquid droplets inside a supramolecular polymer gel with a thin layer of liquid on its surface. When the surface liquid is removed or depleted, the droplets spontaneously release only enough fluid to replace what is lost on the surface. The feature is a major advance for material application, especially the non-stick, slippery material known as SLIPS (Slippery Liquid-Infused Porous Surfaces) developed in the Aizenberg lab. “This system opens the way to create dynamic designer polymers that are capable of self-relubrication and highly regulated and long-lasting anti-fouling behavior,” said Jiaxi Cui, a postdoc in Aizenberg’s lab and a lead author on the paper. Instability is the key to this system’s success. Just as in nature, the secretion system developed by Aizenberg and her team is out of equilibrium, unstable enough to adapt and respond to its surroundings. The supramolecular polymers are reversibly bonded to each other, meaning they can come apart to allow the liquid to filter through the matrix, then stitch themselves back together and adjust to the shrinking liquid reserves. This is a major step forward in the design of self-healing materials. When this system is cut down the middle, the newly exposed polymer surface signals droplets to secrete liquid, quickly filling in the crack and bridging the ends of the broken polymers. Over time, the polymer strands will swim through the liquid and stitch themselves back together. Like the gauge on a gas tank, the system can self-report its liquid levels. As the fluid is secreted, the gel becomes more transparent. The system could also be used to improve drug delivery systems. Certain drugs, such as those used to treat cancer, are harmful if released all at one. A system that could not only tell a chemical where and when to release, but how quickly to release, could have a major impact on certain treatments. The Aizenberg lab is at the forefront of this kind of adaptable and responsive material science. Other contributors to the work include Alison Grinthal, a research scientist at SEAS, and Kaixiang Lin, of the Department of Chemistry and Chemical Biology at Harvard. This research was supported by the U.S. Department of Energy’s Basic Energy Sciences Office (DE-SC0005247) and the Advanced Research Projects Agency-Energy (DE-AR0000326).